The Commissioner General of Examinations W.M.N.J. 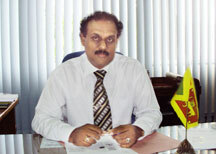 Pushpakumara has been transferred to the Ministry of Education, with immediate effect. The ministry announced that the transfer has been made in order to assist an ongoing investigation into examination papers. The move comes just days after the Deputy Commissioner of Examinations who served as the Head of the Confidential and Agency Examinations Division of the Department of Examinations was suspended over several allegations of negligence and misconduct. On the instructions of Educations Minister Akila Viraj Kariyawasam, an investigation has already commenced into examinations held in the past by the Department of Examinations, papers marking, preparing of question papers, appointment of members to the exam board and protecting the confidentiality of exams.